Guardian/Parents: What does my student’s progress report mean? How do I read my student’s reports? Welcome to the beautiful world of skills-based reports! As a guardian/parent within Kiddom Academy, you will receive weekly emails for each student enrolled with us. In the email, you will see pdf reports attached for each class for assignment and standards. This article will go over skill-based reporting, how to read the reports and ways to use the information to help your student at home. Guardian access is still new to Kiddom. Expect changes and improvements throughout the year as we research, design, and rollout greater access. If you’d like to be a part of the conversation sign up to our Brain Trust that will include parents and guardian sessions or send feedback to support@kiddom.co. 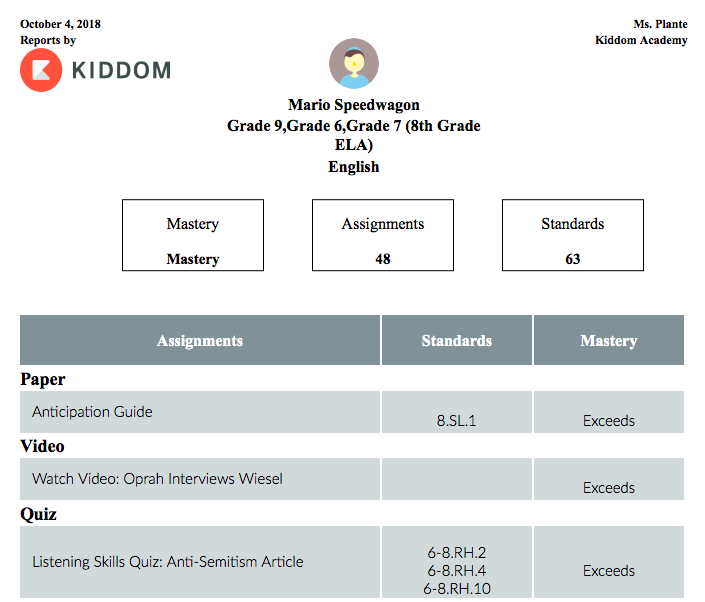 One of the main differences in Kiddom’s reports is communicating student progress. This means that the focus is whether or not the student is mastering certain standards, rather than their average. Let’s be clear on what standards are: standards are objectives of what students should know and be able to demonstrate for grade-level expectations. For example, a Common Core ELA standard for a fifth grader is to “write opinion pieces on topics or texts, supporting a point of view with reasons and information.” This is a major standard that may have some smaller standards and assignments to support the student achieving this overall expectation. Mastery-based learning is called a few names: whether it is skill, standards, proficiency or competency-based learning -- all of these terms represent the shift towards measuring student progress according to specific, measurable competencies. Students are encouraged to focus on a skill until they have shown that they have mastered it, often with several attempts, before moving on. Mastery-based reporting is a different mindset than traditional grades. The goal is not to be an A-student, but to show mastery of appropriate skills. Most students will not be exceeding; if they are, this might mean that they are not being challenged and may need to move on to the next grade-level competencies. What is the Value of Mastery Based Learning? Mastery reports provides you a detailed view on how your student is doing in each of their classes and gives you a holistic view of their progress. It answers: what is my child learning and are they progressing? In addition, it puts emphasis on their growth, not achievement. You’ll notice the following terminology on a mastery report supports this mindset. How Do I Read the Reports? Developing: If you see this next to your student’s assignment don’t fret: it merely means that we have to work a little bit more on this particular skill set. You’ll notice that your student might even have a few resources assigned to them on Kiddom to help build their skills in this particular standard. Approaching: When a student is approaching mastery of a skill set, it means that they have a general ability to complete assignments associated with that skill and understand the minimum content knowledge necessary to complete those tasks, but they still need support in fully completing tasks that require that skill set. Students that are approaching mastery are doing just that: working hard to meet their academic goals. Mastery: Your student has made it! When you see “mastery” listed next to an assignment or a grade, that means your students has achieved the skill sets necessary for that particular topic in class. They are completing it just as intended and age appropriately. Exceeds: Your student must be working really hard to further enhance their skills if they are getting this particular indicator on their reports. Exceeding mastery is going above and beyond what is expected of them at a certain age or grade level based on the skill being assessed. Indeed, many teachers will see this as an indicator that students can take on more complex skills and assign them the next grade level work. Standard reports help answer: What is my child learning? What is their progress? You will notice that you will still see an average performance for all of the standards assessed. This is a snapshot of how your student is doing overall. 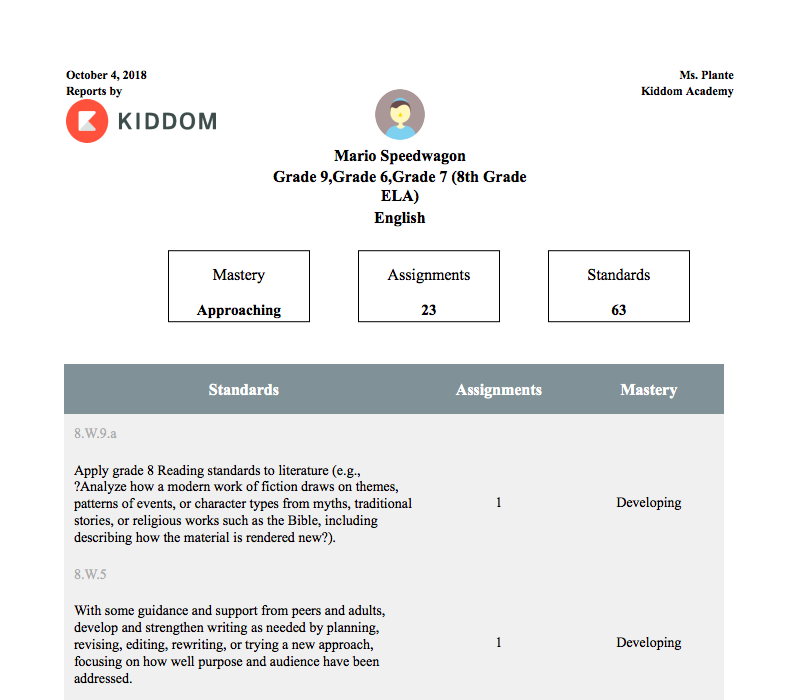 Additionally, you will find details on the specific standards that your student is working on: it will show the standard label, description, and their mastery level for that particular standard. Assignment reports were designed to help parents and students track accountability. These reports help answer: What does my student need to complete? How is my child doing for their assignments? How are they doing for a particular assignment type? The focus is on how they performed for that piece of work, rather than standard. This report gives you more details for the assignment rather than standards. This allows you to track it, see the attached standard labels, and note the student’s mastery level according to that particular assessment. How Can I Use This to Support my Student? Providing mastery reports allows you to have a deeper understanding of your child’s academic development and growth. What’s really great about the reports is that they provide you with a description of each of the standards that your child is working on during each reporting period, so you can understand what they are working on, what they are struggling with, and what they have mastered. What is the Marzano Scale? Whom do I contact if I have not received my student’s reports? Contact our support channel support@kiddom.co and we will help straighten any issues right away. Whom do I contact to follow up on grades? Contact the teacher according to the class that you wish to inquire for following up on your student's progress and growth. Send us feedback and sign up to be a part of our Brain Trust to improve report and access for Guardians/Parents.